Can an Apple a Day Keep High Cholesterol Levels at Bay? You’ve probably heard the saying that an apple a day may keep the doctor or dentist away, but researchers are finding that eating apples may also keep your heart healthy. Apples are widely available and are chock-full of healthy nutrients, such as vitamins and minerals. Additionally, apples contain polyphenols, fiber, and phytosterols, all of which can help lower your cholesterol levels. The nutrients found in apples – as well as in other fruit, have been shown to help improve digestive health and lower your risk of developing certain types of cancers. Can consuming apples keep your cholesterol levels healthy, too? There has been limited research examining the relationship between apple consumption and cholesterol. Most studies didn’t necessarily examine the effect of whole apples but looked at diets supplemented with its healthy components, such as pectin, polyphenols, phytosterols, soluble fiber, or a combination of all of these components in these studies. Most studies have been performed in rats on a high cholesterol diet, and only a few studies have been performed in humans. Studies involving rats have found that the amount of fiber (both insoluble fiber and pectin) found in almost two medium-sized apples (about 6 ounces a piece) is able to lower total cholesterol by up to 10% and raise HDL cholesterol by about 10%. In human studies, consuming up to two to three medium-sized apples resulted in a decrease in total cholesterol levels between 5% and 13%. LDL cholesterol levels were lowered by at least 7% in some studies, and HDL levels were increased by up to 12%. Studies found that the ingredients in apples most likely contributing to the improved cholesterol levels were pectin and polyphenols. A few studies found that the polyphenols contained in apples can lower also the oxidation of LDL, which could contribute to the formation of atherosclerosis. Although some studies saw a slight benefit in adding applies to the diet, other studies did not see a significant difference between consuming apples and improved cholesterol levels. 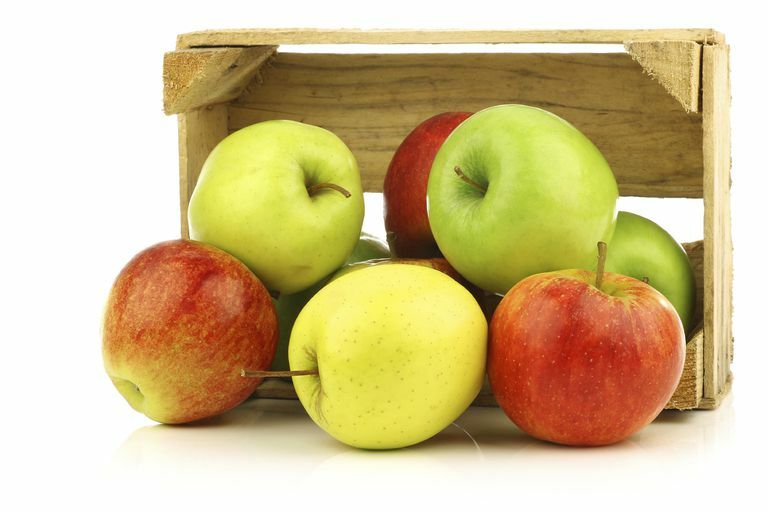 Although you would need to eat up to two or three medium apples a day to see a slight improvement in your lipid profile, apples are still a good food to include in your cholesterol-lowering diet due to the fact that they are high in healthy nutrients – including cholesterol-friendly nutrients such as fiber and polyphenols - and low in fat. In order to get all of the healthy nutrients contained in apples, you should eat the entire apple – including the peel - which is high in pectin and other soluble fibers. Jensen EN, Buch-Andersen T, Ravn-Haren G et al. Mini-review: the effects of apples on plasma cholesterol levels and cardiovascular risk – a review of the evidence. J Horticult Sci Biotechnol 2009; 1:34-41. Ravn-Haren G, Dragsted LO, Buch-Andersen T et al. Intake of whole applies or clear apple juice has contrasting effects on plasma lipids in healthy volunteers. Eur J Nutr 2013; 52:1875-1889.